As the economic slump drags on in the developed world, China is increasingly seen as one of the few places where businesses can still make a healthy profit. This perception is spot on, according to the CEIBS Business Climate Survey 2012 which polled executives from Chinese and foreign companies doing business in the Asian country. One vital component of the survey is the confidence index, which shows that both groups are optimistic that their businesses will do well in 2012. And looking ahead to the next five years, Chinese companies are slightly more bullish about China. They have a confidence level of 7.24 – on a scale from zero (no confidence at all) to 10 (maximum confidence) – versus 7 for foreign companies (see chart 1). Chart 1: How confident are you about 2012, and about next five years? The CEIBS Business Climate Survey 2012 is aimed at helping firms better understand the challenges and success factors of doing business in China. A team of CEIBS researchers analysed the responses of 602 executives on a wide range of important issues such as business performance in 2011, level of confidence, concerns and success factors. Our results show that, for both foreign and Chinese firms, three quarters of them saw their revenue grow in China in 2011; and most of their operations in China are quite profitable. Overall, both groups are confident about the country’s economic outlook for the next 5 years. However, there are a few big challenges for their continued success. These include HR issues, rising costs, and a slowdown in economic growth in China. For Chinese firms to continue being successful in China they should: pay more attention to corporate governance, invest more in R&D and other innovation activities, and provide more value-added services. Merely focusing on low prices will not be effective. Our advice to foreign companies doing business in China: As the competition from local Chinese firms becomes stronger and stronger, foreign firms need to i) pay more attention to recruiting and retaining management talent, and ii) invest more in developing innovative products and business models that will better fit with local market needs. Chinese and foreign companies are aware of the challenges caused by the slowdown of economic growth in China but they are still optimistic about doing business in the country in both the short and mid-term. Both groups are increasingly concerned about the rising cost of labour and raw materials. As a result, they consider business model transformation, brand building and product/technology innovation critical for future success. 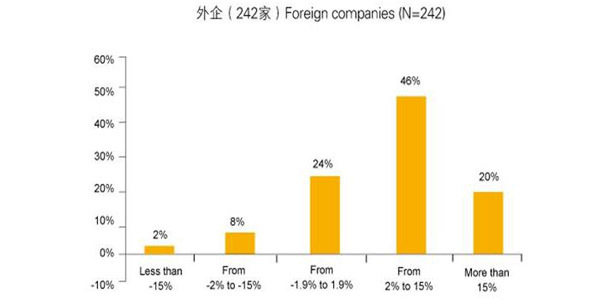 Both Chinese and foreign companies plan to increase their investments in China in 2012 (see chart 2). 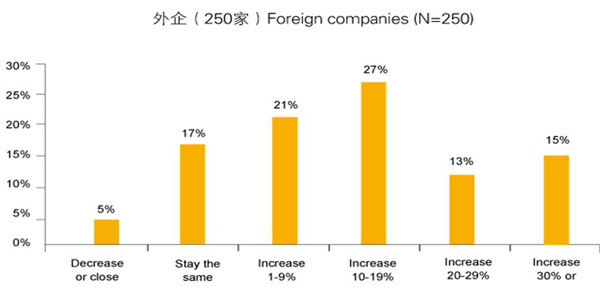 About 59% of Chinese companies and 55% of foreign companies plan to increase their investment by over 10% in 2012. And 22% of Chinese and 15% of foreign companies plan to increase investment by more than 30%. This optimism stems from their companies’ performance in 2011. 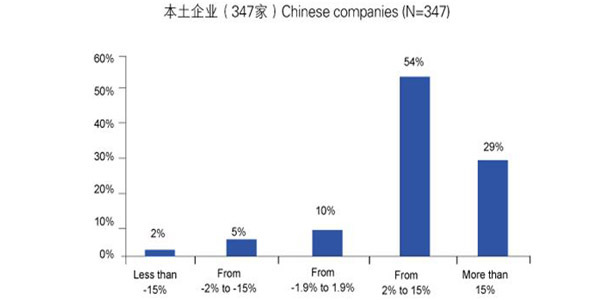 As chart 3 shows, 83% of Chinese firms declared profits for 2011 while 29% of the total declared profits of 15% or more. Most foreign firms are also profitable, but not as many as their Chinese counterparts. We found that 66% of the foreigners declared positive results in 2011, and 20% of the total survey group declared profits of 15% or more. Again, this supports Chinese companies’ confidence in the mid-term and it proves that the growth in revenue is not at the cost of profits. 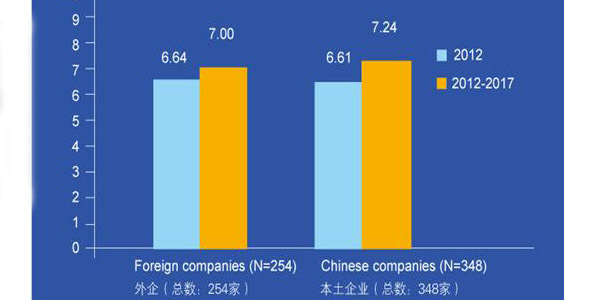 Meanwhile, about 75% of Chinese companies and 76% of foreign companies expect the sales revenue of their company in 2011 to be higher than 2010. 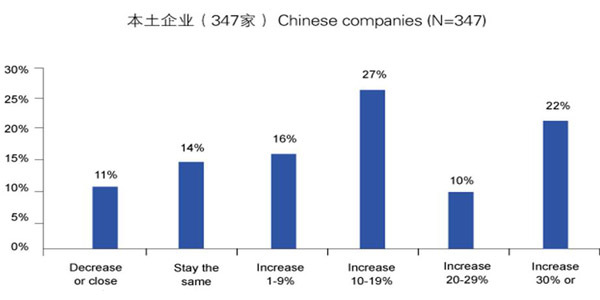 More Chinese companies (42%) expect revenues to increase by more than 15%, compared to 37% of foreign companies. This robust growth serves as the source of confidence for companies and explains why Chinese companies are more confident than foreign companies in the mid-term. When we asked how they prepare their companies for future challenges, the answers from the two groups were quite different. While Chinese companies point to business transformation as the key factor, foreign companies place human resources management on the top of their list. Another interesting difference is that Chinese include corporate governance as one of their top priorities while foreigners don’t even mention it. There are some differences between the two groups in terms of factors that they think are critical to their success (see chart 4). 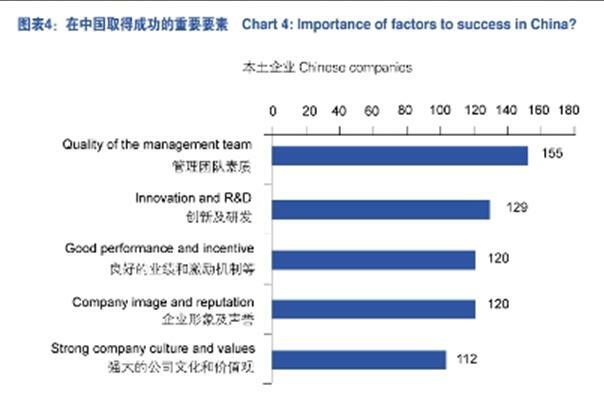 While Chinese companies consider the quality of their management team the top factor, foreign companies point to selecting, training, and retaining key employees. Another interesting difference is that innovation is ranked number two by the Chinese companies, but it occupies only fifth place on the foreigners’ list. This might signal a change in strategy by Chinese companies who are moving away from pure price competition to more value-added activities. It might be the consequence of an increase in the cost of raw material and the labour force. In other words, Chinese firms found it difficult to win the market by just competing on the basis of price." The survey was completed by 602 executives who occupy a variety of positions in their organizations. Among them were 228 CEOs, GMs, and company owners while the rest represented all the main business functions: HR, Finance, Marketing, Sales, Operations and Research & Development. Of those executives, 78% were male and 22% female. They have an average of 14 years of work experience. This broad and experienced sample added rich and valuable perspectives to the survey. Juan Antonio Fernandez is Professor of Management at CEIBS while Zhou Dongsheng is Professor of Marketing.